This is a program for people who aims to brush up their Japanese for the purpose of work, everyday life and enhancement of their hobbies. You will be able to increase your Japanese language ability comprehensively because you will be learning the language in general through reading, writing, listening and speaking. We have a special curriculum for those who wish to take the JLPT test which is held twice a year in July and December. ※For more information regarding the student visa application, please refer to the school’s application guidelines. For a short period of time you will be able to increase your Japanese language ability comprehensively while experiencing life in Japan. We have a special curriculum for those who wishes to take the JLPT which is held twice a year in July and December. This is a program that lets you experience Japanese culture and interact with Japanese people while studying Japanese during a short period like a summer vacation. You can participate in this program more easily compared to a long-term studies, and we promise that you will be able to have valuable experiences you may not get during regular travel. Program to feel cherry blossoms by using your five senses! 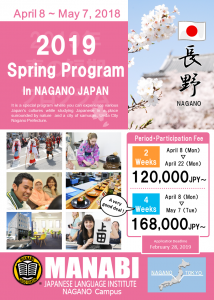 Enroll in this special program and experience a variety of Japanese culture while studying in the Japanese city of samurai, surrounded by nature, Ueda City, Nagano prefecture. A class filled with fun, seeing cherry blossoms in a famous castle, cultural heritage and hot spring tours make this unique. You can experience what Japan really is! Summer activities that can only be experienced here, a place where the Winter Olympics was once held, Nagano Prefecture. Experience a variety of cultural activities and interact with the Japanese people while polishing your Japanese skills. Participate in festivals together with the Japanese people. There are lots of repeaters in this program every year. A program where you can experience Japan’s pop culture in Akihabara, and Edo Period’s tradition in Asakusa. You can also attend and experience an animation class, making of Japanese cuisines, fireworks in Sumida River and a lot more. Accommodation is in walking distance from and to Tokyo Sky Tree.